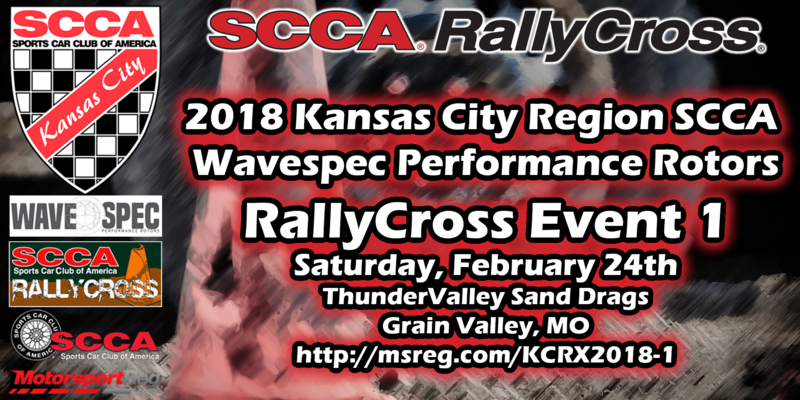 The Kansas City Region SCCA opens its 2018 Wavespec Performance Rotors RallyCross Championship of the year on Saturday, February 24th at the Thunder Valley Sand Drags in Grain Valley, MO. For those of you with Solo and Street cars, this is the time to come out and see what everyone has been talking about! The course will be run on the hard-packed clay of the drag strip and the grass parking lot, both of which are smooth and level, and resistant to rutting. The site is just outside of Grain Valley, MO with gas and food located conveniently close. The Thunder Valley Sand Drags are located approximately 20 miles east of Kansas City, MO. Take exit 24 (Grain Valley) on I-70. Go South approximately 2 miles to Old US 40 Highway. Turn east (left) on Old US 40 Hwy (next to Casey's General Store) Go approximately 3/4 mile to track entrance located on the left hand side. Wavespec Performance Rotors specializes in producing high performance brake rotors for the discerning enthusiast and racer looking to maximize braking in an OEM size brake rotor. Their unique scalloped design reduces rotating and unsprung mass while providing exceptional bite and improved thermal performance. Available in a racing grade Black Line, high performance Silver Line, and a visually impactful Sport Line, our rotors are designed to bolt on with ease. Tagged Rallycross, registration, Thunder Valley Sand Drags, Wavespec. Bookmark the permalink.